Without a second thought, you yield to busy schedules filled with work, errands and life in general. Today, let yourself yield to nothing. Enjoy a day filled with no schedules, no errands… nothing. Then, take a look around you. Beauty is everywhere. What is the tree? It almost looks like magnolias. Gorgeous color! 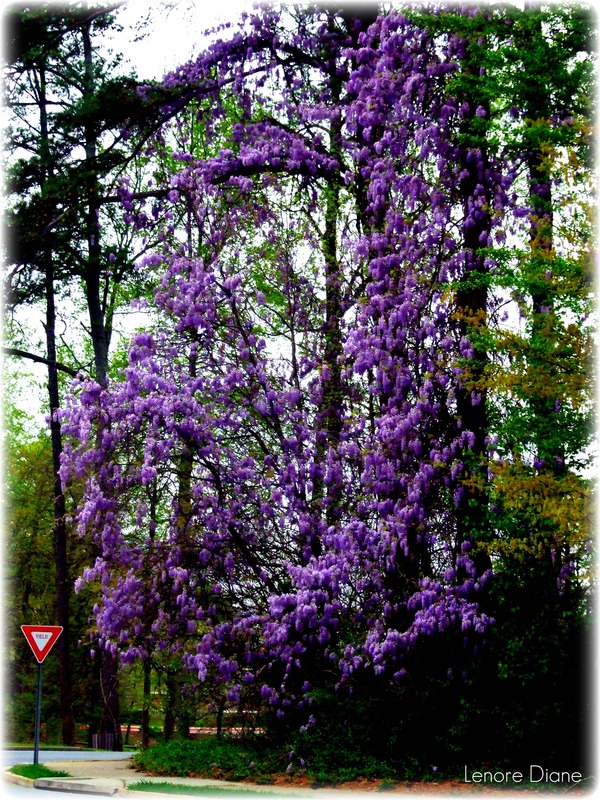 Actually, KD, it is a vine: Chinese Wisteria vine – beautiful and fragrant. If you are familiar with kudzu (which has taken over the south), you will have an idea of this wine. Some welcome Chinese Wisteria, because it is decorative, but others hate it because it grows and spreads quickly, taking over trees, bushes, etc. I love photos of trees! I’m glad you like this shot, Next Stop. I’m not sure what the tree is underneath the purple flowering vine – but the vine is Chinese Wisteria. Very common in this area, along with another invasive vine called Kudzu. Folks either love or hate Chinese Wisteria based on whether or not they planted it and control it or whether it appeared and took over their plants. GA is so beautiful, especially the hills around Atlanta. What is it? The vine/flower you mean? It is Chinese Wisteria. I love this vine, and I look forward to seeing it every spring. Gorgeous photo, Lenore. You find the best shots – do you wander around with your camera all day? That purple is amazing! Beautiful pic. And i agree, sometimes you just have to stop and smell the wisteria. 😉 Have a great day. Ha! Nicely played, Fraha. Thank you! Hello Mags, thank you. I am glad you enjoyed the picture. Goodness Gracious .. that vine is breathtakingly beautiful! We have nothing quite that dramatic here in the midwest! (at least nothing I’ve ever seen!) I remember when I lived in Louisiana, Texas and Hawaii we always had something gorgeous with wonderful fragrances growing somewhere, all the time, it seemed. Nebraska leaves a little to be desired in those categories! But it is pretty and green here right now, so I’m not complaining! Usually our March is cold, blustery and snowy 😦 I still miss the South … maybe someday we’ll return again! Meanwhile, I’ll rely on beautiful photos like these! Have a great week. Green is good, Donna. But I love the color – It would take some time to get used to the loss of the colors of the south. I am glad my photos brighten your cold and blustery days. I hope you have a great week, too! I always love comments from you, Stasha. I’m glad this one caught your eye. Thank you for letting me know. it’s all shades of picturesque, though! So nice! Thank you, SIG. I am glad you liked it. Thank you. I do like this shot.